There are lots of ways to arrive at the Monaco Yacht Show, some more stylish than others. The airport bus is quick, efficient, and air conditioned, but perhaps a little humdrum for a man who wishes to be taken seriously on the quayside at Port Hercule. People often overlook the train, but the views are spectacular, and it&apos;s by far the fastest way if you&apos;re staying in a pretty coastal resort like Menton, rather than among the high-rises of Monaco itself. A limousine can whisk you to the show in dignified silence—a silence destined to be broken by your driver apologizing about the traffic once you get to the edge of town. High-rollers flying into Nice, France invariably take the helicopter from the airport, which promises to provide the most noticeable arrival at the show—guaranteed to impress until you find that it lands not in the heart of Monaco, but next door to the show at Fontvieille, where you must hail a taxi and join all the other disillusioned big shots fuming in the gridlock. I&apos;ve tried them all, but this year I found the ultimate mode of boat-show transport: quick, luxurious, exclusive, and guaranteed to create a stir on arrival. 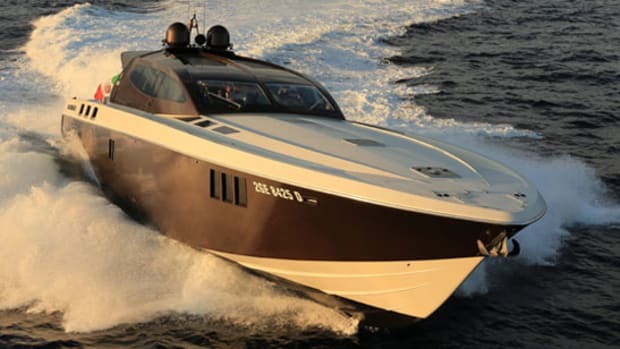 I joined the CNM Continental 80 down the coast at Beaulieu-sur-Mer, France, with two objects in mind: a thorough sea trial of this sleek machine from a new Italian yard, followed by a comfortable, traffic-free ride into Monaco. 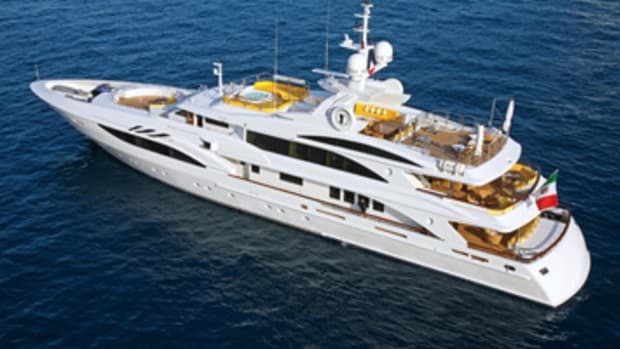 Cantieri Navali del Mediterraneo (CNM) hails from the River Tiber just downstream of Rome and was set up in the old Itama shipyard (Itama having moved since its acquisition by the Ferretti Group) by property developer Salvatore d&apos;Agostino. 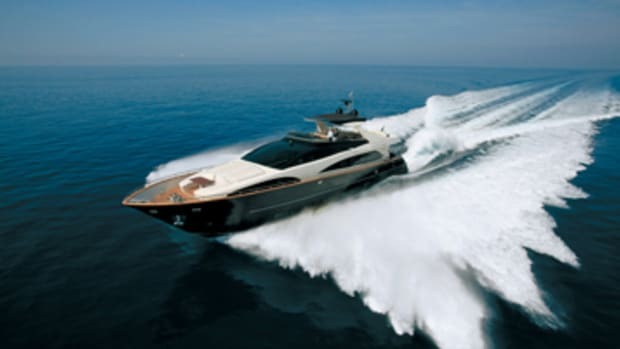 Mario Amati, the founder of Itama, has been retained by the new yard as a consultant, and an experienced team of designers and engineers was hired to create a new range of boats, of which the Continental is just the first. 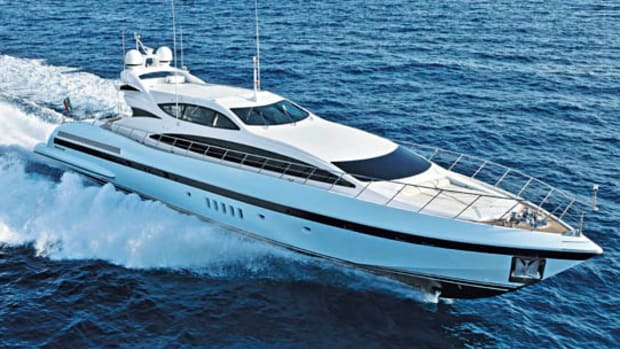 She is an imposing vessel, with a great-looking, curved sheer, a vast foredeck, and a hunched superstructure aft that imparts a muscular, coiled-spring look. 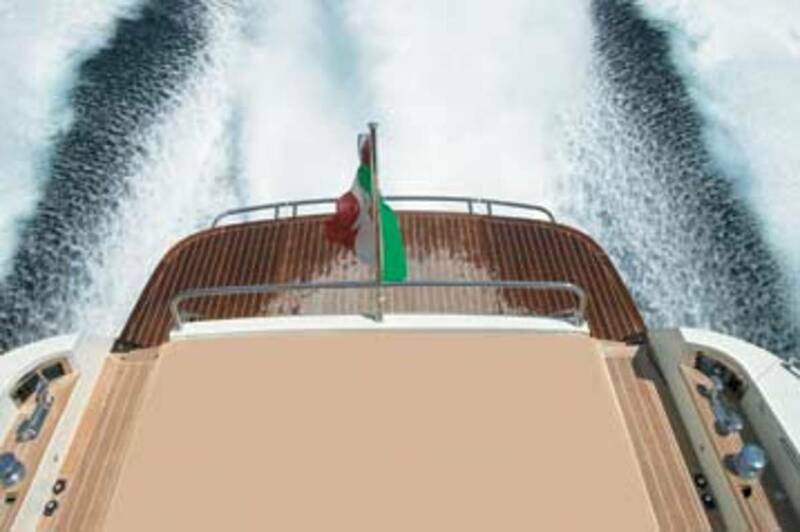 A family resemblance to the bigger boats of the Baia range is no coincidence; both marques were designed by naval architect Alberto Ascenzi of Genoa University. And CNM is not just capitalizing on the boom enjoyed by other Italian shipyards. 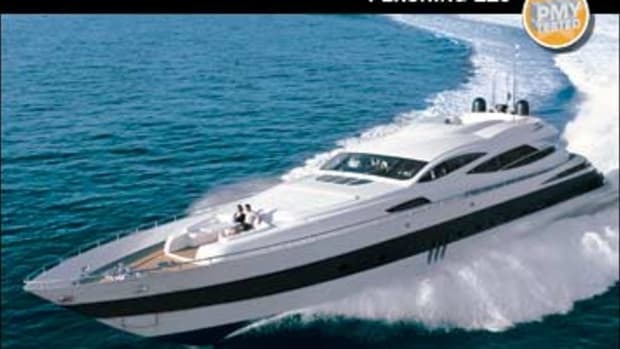 It has set out to create a highly engineered, semicustom yacht at the top end of the market, and one feature in particular—the "floating floor" that rests on an insulated aluminum frame—is a big-yacht sound- and vibration-damping system that is rare on a boat this size. With low-volume production and high-end aspirations, CNM is happy to meet customers more than halfway when it comes to customizing. If you want the saloon TV concealed behind the sideboard on an electric elevator mount, that will be no problem. 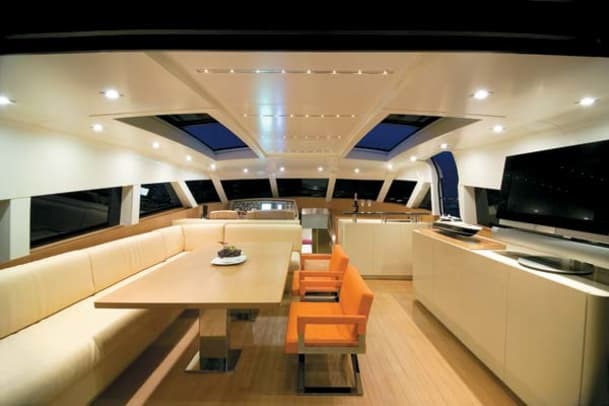 Different interior colors and finishes entail a simple consultation with the design team, although this yacht&apos;s combination of burgundy leather flooring, beech bulkheads, and cream lacquers trod a pretty sure-footed line between opulent and comfortable. I felt that at 21½ inches, the guardrails were on the low side, but the yard can make them taller. All you have to do is ask. 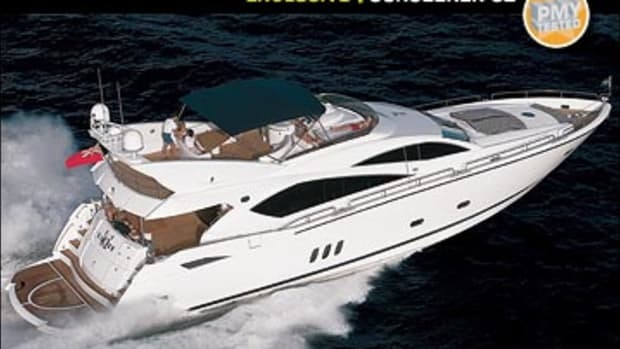 The Continental&apos;s below-decks layout is unusual for a vessel of this size in having the owner&apos;s suite in the forepeak, with its double berth slightly offset to starboard. 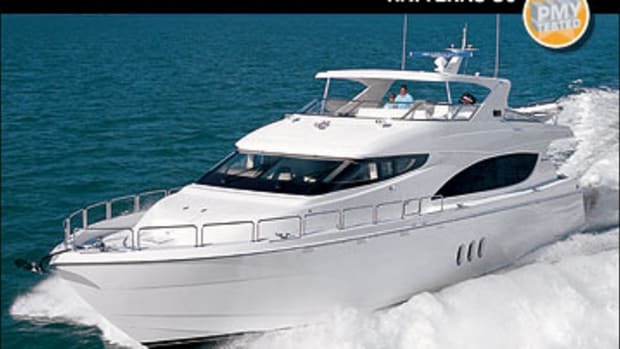 Here as elsewhere a lot of thought has clearly gone into providing adequate stowage for a cruising couple, with two big hanging lockers on each side and plenty of drawers. Just as you&apos;re approving of this arrangement but wondering where the designers have hidden the head, you find it through that door leading forward into the bow. 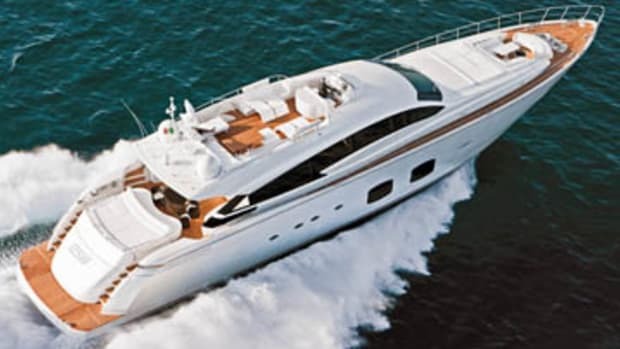 Although up here the pointed end is getting very pointed, particularly at the waterline, there is still plenty of space to make the most of a full-beam, V-shape head, with a toilet and bidet, his-and-her sinks, and a big shower compartment with a glass front. A porthole on each side and an overhead hatch let in plenty of daylight, making an already generously proportioned area seem even bigger. I haven&apos;t seen a better owner&apos;s head on an 80-foot open. 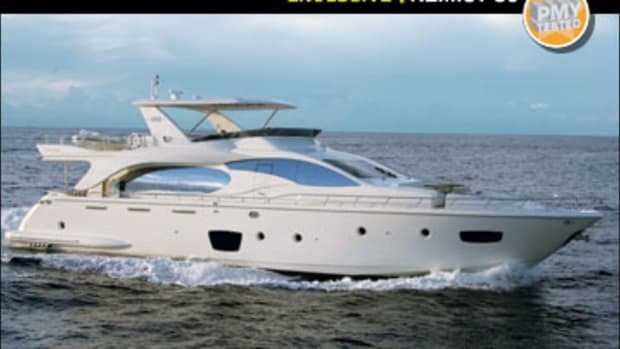 Down, aft, and occupying only half the beam (the large, well-fitted-out galley takes up the other half), the VIP is still a good-size suite, with a berth the same size as the owner&apos;s and almost as much stowage. The two guest cabins lie amidships, a twin to port and a single to starboard, although some 3&apos;6" across, the single berth could suit a couple as long as they&apos;re thin or recently engaged, or preferably both. All are served by en suite heads. There is no saloon down here, which is why the cabins are so generously proportioned, but the designers have made up for it on the main deck. The saloon up here and everything about it is vast. The sideboard to starboard is as large as anything you&apos;d put in your house, and the cabinets across the front are big enough to accommodate an air handler, &apos;fridge, and ice maker, as well as a substantial cocktail cabinet and additional stowage space. With a table measuring 6&apos;8" x 3&apos;9", you could host ping-pong tournaments. There&apos;s plenty of room for spectators in the cockpit. 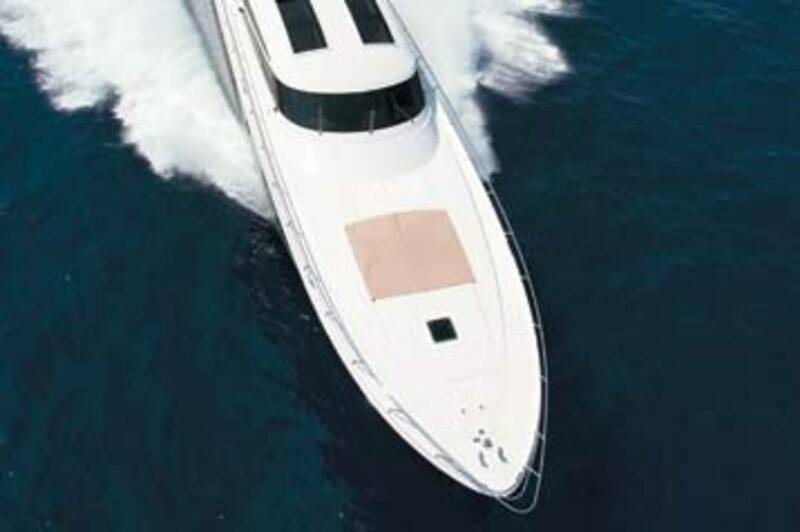 Even with all of these attributes, this first yacht has shown up several things that CNM will be doing differently next time. The gensets, somewhat inaccessibe outboard of the engines, will be shifted. Less straightforward, but still something the yard is determined to follow through on, is improving visibility from the helm, particularly to starboard. This will involve retooling the superstructure moldings to incorporate more glass above the main side windows, while the windscreen is being redesigned as a two-piece with just a single, central support. Also, a window will be added to the starboard side door. All of which will help a lot, for visibility was the only issue that came up once we got underway. Everything else was just fine. The Continental is above all a performance machine, with twin 1,825-hp Caterpillar C32s bellowing away underfoot, driving surface-piercing props on big Arnesons. Considering she displaced something like 50 tons all up on the day of our test, I never expected acceleration to be anything to write home about. But once the engine-management computers and five-blade Rolla props realized they were playing on the same team, the big yacht&apos;s performance and handling were everything you could wish for: sure-footed in tight turns, with a good range of cruising speeds from the low 20s all the way up, an impressive top speed of more than 40 knots, and a firm but not hard, upwind ride. Drive trim was not an issue—the "zero" setting proved perfectly adequate for most situations—and throttle and helm responses were light and intuitive. It&apos;s not often that you can describe an 80-footer as a driver&apos;s machine, but that&apos;s how it felt as the headlands of the Cte d&apos;Azur flashed past to port and the Continental carved a dashing white arrow across the light Mediterranean swell. It was positively liberating. Slowing to glide through the superyachts anchored off Monaco, I reflected that it was a hell of a lot more fun than sitting in traffic.